Not long ago, at a session of the UN General Assembly, Armenia's president Serzh Sargsyan declared that in the past few years Armenia has accepted 16,000 refugees from Syria. In his opinion, this makes Armenia one of Europe's leading countries in number of refugees accepted. According to UNHCR estimates, Armenia currently hosts some 3,238 officially registered refugees, along with 12,450 'people in a refugee-like situation'—all of them from Syria. This second category refers to the majority of Syrian Armenians who, upon arriving in Armenia, prefer not to apply for refugee status, but instead apply for either Armenian citizenship or a 10-year residence permit. Both of these are rights extended by Armenian law to foreign citizens of Armenian descent. In contrast to other European countries, the overwhelming majority of Syrian refugees in Armenia are ethnic Armenians. But be that as it may, 15,000 refugees is not an insignificant number for a country with a population of three million and a GDP of $3,500 per capita. Until the beginning of the civil war in Syria, the country's Armenian community, by various estimates, numbered between 80,000 to 100,000. Sako Arian, editor of the Arevelq website dedicated to issues in the Middle East, believes that the community actually numbered some 60,000 to 70,000 Armenians, as their number in Syria had slowly been declining since the 1970s. According to UNHCR estimates, Armenia currently hosts some 3,238 officially registered refugees. Of course, not all Syrian Armenians fleeing the conflict have settled in Armenia. In Arian's words, many have left for Lebanon (around 15,000), Jordan (2,000) and western states (around 8,000). In order to reach Armenia, Syrian Armenians have had to undertake a long journey through Turkey and—given the closure of the Armenian-Turkish border—through Georgia. Those who have the money depart for Lebanon and fly to Yerevan, the capital of Armenia, via Beirut. Others remain in Lebanon, which has a large and well-established Armenian community. As Harout Ekmanian, a Syrian-Armenian journalist from Aleppo, says, the difficult journey to Armenia and the country's low living standards are reasons why Syrians heading to Yerevan are almost exclusively ethnic Armenians. Besides, if ethnic Armenians benefit from preferential treatment in receiving residence permits and Armenian citizenship, then other Syrians are faced with the complicated procedure of applying for refugee status. Syrian refugees in Armenia who are not of Armenian descent are generally few in number, and often from mixed families. The Armenians of Syria, although never the most numerous community, occupy a very special place in the Armenian diaspora. Alongside the Armenians in Lebanon, Syria was home to one of the oldest Armenian communities in the world and played an important cultural role. Armenians have lived in Syria long before the genocide of 1915. Hundreds of thousands of Armenians appeared on the territory of modern Syria in 1915 after the Turkish state deported Armenians to camps in the desert near the Syrian town of Deir-ez-Zor, where they were condemned to a slow death of hunger and disease. Of those who managed to survive, many settled in Syria. The most numerous Armenian community was in Aleppo, but many Armenians lived in other cities across Syria—in Damascus, Homs, Latakia and Qamishli. 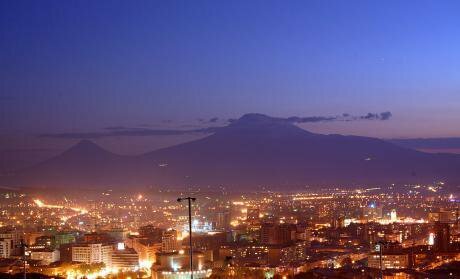 Yerevan, capital of the Republic of Armenia, in the shadow of Mount Ararat. Photo (CC): NersesToday, there is no reliable data on the number of Armenians who still live in Syria. According to Harout Ekmanian, his sources in Syria indicate around 5,000 families, but it should be noted that this includes some families whose members have already settled in Armenia. By Sako Arian's estimation, around 15,000 Armenians remain in Syria. Many live in Aleppo, where the Armenian quarter has become a kind of fortress—the local Armenian youth have formed a militia for its defence. In Ekmanian's words, on the basis of information about the number of students in Aleppo's Armenian schools, it can be concluded that there are around 7,000 to 8,000 Armenians in the city. Arian estimates 8,000 to 10,000. Apart from Aleppo, on the whole, Armenians remain in Damascus and the coastal region, in the cities of Latakia and Tartus, controlled at present by government forces. Ekmanian states that many Armenians have resettled in these cities from regions badly hit by conflict, and are in general those who could not afford to travel to Armenia. To the north east, Armenians live in the city of Qamishli in Syria's Kurdish region, but their number has greatly decreased. Arian says that Kurds are loyal to their friendship with the Armenian and with other Christian communities. The Armenian quarter has been preserved, and is defended by an Armenian militia that cooperates with the Kurdish self-defence forces. There is also the Armenian settlement of Kessab, not far from the Turkish border. In 2014, divisions of the opposition forces supported by Turkey briefly occupied Kessab, and the majority of the town's Armenians fled. Some then returned after Kessab was retaken by government forces. Perhaps most surprisingly, several Armenian families remained until very recently in Raqqa, the de-facto capital of the Islamic State. These people survived by repairing cars belonging to Islamic State fighters—Armenians in Syria have traditionally been seen as the best car mechanics. According to the latest data, the last Armenians in Raqqa fled the city following the beginning of the Russian bombing campaign. On the whole, the Armenians of Syria—much like other minorities—felt relatively comfortable under the Assad regime. Armenians in the Middle East, says Ekmanian, usually preferred stability to any significant changes, and their community in Syria was no exception. Nevertheless, when demonstrations against the Assad regime began, some Armenians supported the dissidents and opposition. The majority of Armenians—fearing religious extremism amongst the Sunni Muslim majority—see in the Assad regime if not their defender, then at least the lesser of two evils. Be that as it may, most Syrian Armenians realise that the Syria they fled has changed irreversibly. Traditionally, the Armenian community in Syria was relatively prosperous. Many Armenians worked as doctors and engineers, and many more owned their own businesses. When the war broke out, those who had means to make a living found themselves at the mercy of various armed groups. Fighters, or simply bandits, came from all sides and simply attacked more affluent houses, taking people’s business and hostages for ransom. Many Syrian-Armenian families are a lot less lucky.Many of their homes have been destroyed in the fighting. Some have been able to keep hold of all their property, while others have sunk deeper into debt, in order to pay ransom money for their relatives. If we add this to the large amount of money needed to reach Armenia, then it is clear that for the majority of Syria Armenians, their former prosperity has taken a hit. In any case, Armenia itself has enough problems. The country has a high level of unemployment, with hundreds of thousands of Armenian labour migrants looking for work abroad, generally in Russia. The economy, which has not recovered since 2008, is facing new challenges connected with the current economic situation in Russia. The closed border with Turkey and the danger of renewed hostilities with Azerbaijan over Nagorno-Karabakh do not give Armenia's residents any further cause for optimism. Given the inefficient and corrupt public officials typical of post-Soviet states, Syrian Armenians are not faced with an easy situation in their historic homeland. Syrian-Armenian cafe in Yerevan. Photo (c) Maxim EdwardsSako Arian believes that, taking into account these very real difficulties, the very fact that Armenia has accepted refugees should be seen positively. Harout Ekmanian takes a more critical line on the Armenian authorities' approach towards helping refugees. For Ekmanian, government organs have been more concerned with PR efforts and grandiose statements than practical, functioning programmes. One such example raised by Ekmanian – which turned out to be a complete fiasco – was the widely publicised Nor Haleb ('New Aleppo') project. This project proposed to build a housing complex specifically for Syrian Armenians in the town of Ashtarak, not far from Yerevan. In this sense, the project was supposed not only to solve the housing problem, but to recreate the atmosphere of the Armenian quarter of Aleppo for the resettled refugees. However, as the programme progressed it became clear that the Armenian government did not have the necessary resources to complete it, and New Aleppo became a commercial development. It turned out that only people with independent means could buy an apartment for themselves in the complex. The few Syrian-Armenians who could afford to do so had no interest in New Aleppo, given that for roughly the same sum they could have bought themselves an apartment in Yerevan. Only a few dozen Syrian Armenians have settled in Nagorno Karabakh. Sarkis Balkhian, representative of the Aleppo charity, had doubts about the project for a different reason. After all, even if the project did turn out to be feasible, it would facilitate isolation, rather than integration, of Syrian Armenians. Armenians in Syria used to face the task of preserving their language, culture and identity, prompting a sense of isolation from wider Syrian society. In today's Armenia, Syrian Armenians no longer need to fight to preserve their culture and identity, but isolationist instincts still make themselves felt. For that reason, Balkhian believes that Armenia needs projects to facilitate the integration of Syrian Armenians into society. Outside Yerevan, another issue that has caused a lot of noise is the resettlement of Syrian Armenians in the disputed territory of Nagorno Karabakh and adjacent areas, which are considered to have been 'liberated' in Armenia, but internationally recognised as the territory of Azerbaijan. As Ekmanian states, the flames of this story have been fanned by both sides: Armenian media outlets, especially those with a nationalist bent, praise the resettlement as a success story, while Azerbaijani media sees it as yet further evidence of Armenia's policies of occupation. In reality, the number of Syrian Armenian resettling in the unrecognised Nagorno Karabakh Repubic is negligible: there simply is no 'grand plan' of mass resettlement to speak of. Both Arian and Ekmanian estimate that only a few dozen Syrian Armenians have settled in Nagorno Karabakh, and certainly no more than 100. In general, these people come from an agricultural background, and hail from rural regions of Syria such as Kessab and Qamishli. They worked the land in Syria and continue to do the same in Nagorno Karabakh. Further resettlement of Syrian Armenians in Nagorno Karabakh is unlikely. The majority of Syrian Armenians are city dwellers, used to life in large cities such as Aleppo and Damascus. Attracting them to Nagorno Karabakh would be no mean feat. The authorities in Stepanakert and Yerevan now approach this question with great caution, wary of exacerbating an already tense situation. Where the government does not have enough resources to help Syrian Armenians, NGOs and charitable organisations are stepping in. Among their number are organisations founded by Syrian Armenians themselves, such as the Aleppo charity (otherwise known as the Aleppo Compatriots' Charitable Organisation) and the Coordination Centre for Syrian Armenian Issues. These organisations work with the Armenian authorities, helping in their own way to build a bridge between the government and the Syrian Armenian community. They are generally financed by Armenian communities from North America and western Europe, thanks to whom they are able to provide refugees with accommodation and the most urgently needed essentials. Those who are able to start a business are helped by the Support Centre for Small and Medium Businesses, a government organisation which provides small loans on preferential terms. The money is not a lot, but it's enough to start a business. These are usually for the owners of small restaurants, street food vendors, car mechanics or hairdressers. Most often the owner and their relatives run these businesses, which are not hugely profitable but allow them to survive. Public universities provide discounts to students from Syrian Armenian refugee families, which are mostly covered by the charitable organisations. In the window of a Yerevan hairdresser's salon hangs a sign reading 'Syrian Armenians work here'. 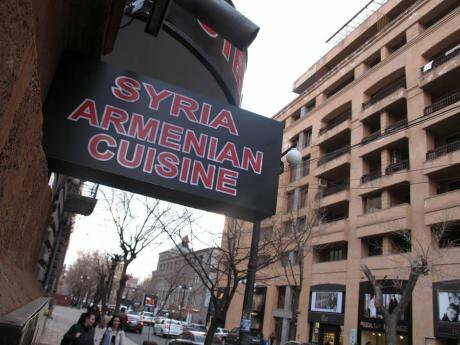 This is a method of attracting customers—Yerevan residents have already formed a positive impression of Syrian Armenians, believing them to be reliable and highly skilled workers. Syrian food has become particularly popular. Over the past couple of years, tens of small establishments have opened across Yerevan bearing names unexpected for the city – 'Abu Akob', 'Aleppo Lunches' or 'Pizza and Za'atar'. They offer an authentic atmosphere, and not only the hummus and falafel which have become so familiar, but more exotic Middle Eastern dishes.